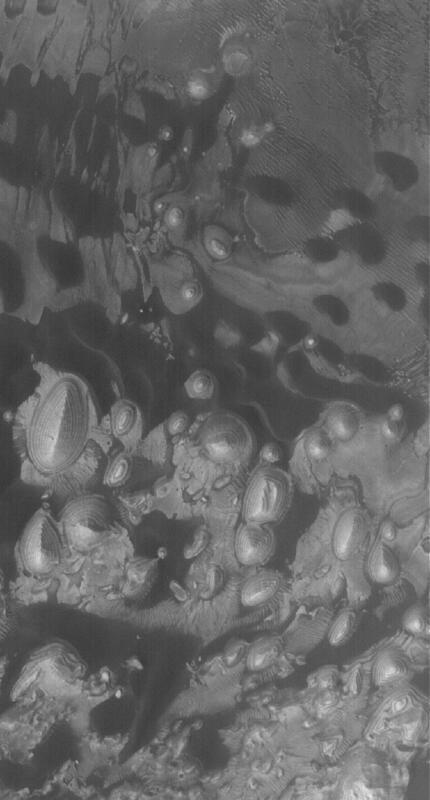 This Mars Global Surveyor (MGS) Mars Orbiter Camera (MOC) image shows martian sediment in two basic forms: (1) light-toned, layered, sedimentary rock outcrops and (2) dark, windblown sand dunes. The dark sand of the dunes is most likely composed of grains rich in iron-, magnesium-, aluminum-, and silicon-bearing minerals. The hills and mounds of layered sedimentary rock were once more extensive, covering the entire scene shown here, which occurs on the floor of a crater in western Arabia Terra.